challenging levels divided into four adventurous episodes and three exciting game modes. It's as simple as that. Connect Mania is about connecting dots of the same color. The minimum number of dots you can connect is two, but by connecting longer sequences of dots you will receive more points. 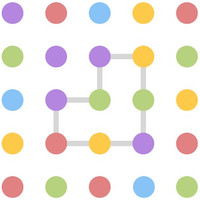 By closing a sequence, for example by connecting dots in the shape of a quadrant, all dots of that color will be erased from the board and you will receive even more points. Feel free to try out the basic principles of the game on the board to the left! Do you want more? Keep reading to learn about the hundred different levels and the three exciting game modes. A hundred epic levels divided into four adventurous episodes. Three uniquely exciting game modes. As more levels are unlocked, additional layers of complexity are added in a fun and challenging way. New game modes are introduced which guarantees that the game never gets boring. The first game mode is dead simple. 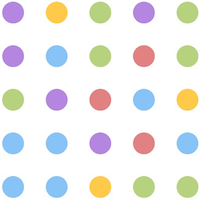 Connect dots of the same color and make sequences of as many dots as possible to collect points. The second mode is about erasing and reorganizing dots in a manner that ultimately allows you to connect the dots in the shape drawn in grey. The third game mode includes black dots that can't be connected. 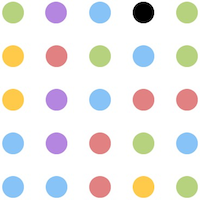 The goal is to erase other dots in order to sink the black dots to the bottom. Connect to Facebook and compete with your friends' high scores. © 2013 One Wave AB. All Rights Reserved.